Update, June 19: PUBG’s first Steam sale is underway, following some impressive new sales numbers. PlayerUnknown’s Battlegrounds has reached yet another sales milestone, and the developers are celebrating with the game’s first Steam sale. The game has sold 50 million units worldwide across PC and Xbox, and the player numbers are up to 400 million once you factor in the free mobile edition. All told, PUBG Corp says it’s got 87 million daily active users across all platforms. As of today, PlayerUnknown’s Battlegrounds is available at a 33% discount on Steam, bringing the price down to $19.99 / £18.08 / €19.99. This deal will last until July 5. This is notably the first time the game’s ever had its own proper Steam sale. Other third-party sellers have offered slight discounts on PUBG in the past, but this is still the cheapest the game’s ever been. For more online madness, check out our suggestions for the best multiplayer games. 50 million sold is impressive, even in light of PUBG’s somewhat decreasing player numbers. While the number of people playing remains astoundingly high – still by far the most-played game on Steam by player count – the game has seen a significant drop-off in popularity since the start of the year. The all-time peak player count for PlayerUnknown’s Battlegrounds is 3,236,027, a figure it reached in mid-January, far above those of its biggest competitors on Steam: Dota 2 and Counter-Strike: Global Offensive. As of today, its 24-hour peak sits at 1,282,998, less than half of what it was five months ago, according to Steam Charts. It’s worth noting that PUBG came out over a year ago, and with so many multiplayer games vying for your attention, it’s not too surprising that its player count would slip – especially given the popularity of Fortnite, which offers an enticing zero dollar price tag. 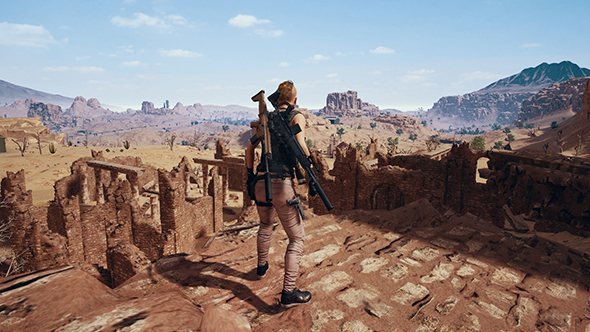 It’s also been beset by issues with cheaters, which will have driven honest players away despite PUBG Corp’s best efforts. If you do fancy pitting the two directly against one another, check out our take on which is better – Fortnite or PUBG. In the announcement, PUBG Corp even says “We know there’s still so much we can do to make PUBG a better game for our players,” emphasized with bold text. But with all that in mind, PUBG is still by far the most-played game on Steam, and its first sale will only help to cement that position. Whether that’ll be enough to stem the rising tide of other battle royales remains to be seen, but for now PUBG is doing just fine.